Known for its lively social scene, Brisbane always manages to outdo itself every New Year’s Eve. 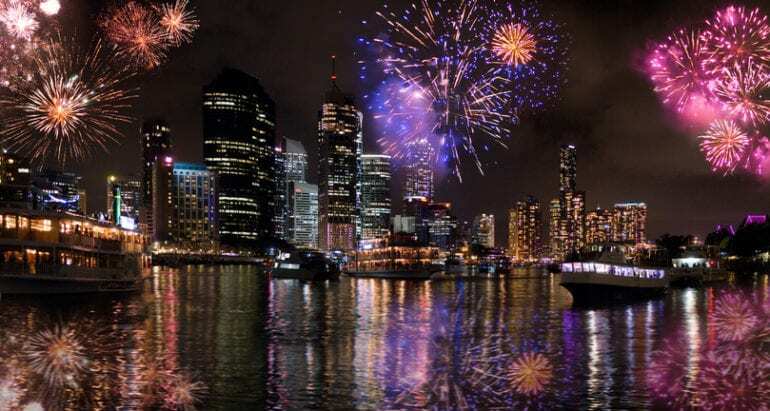 This year, you can expect nothing less with fireworks being launched from almost 20 different locations along Brisbane River, as well as from barges. Practically every bar, restaurant, club and cafe in the city will be holding a special celebration so make sure you don’t miss out! Grab the family and head down to the South Bank Parklands for the South Bank Fireworks Spectacular. There are displays at 8:30pm for the kids, and later at midnight for the adults. Feeling peckish? Just across South Bank, the city will be screening family-friendly movies for free, as well as providing food trucks and entertainment. Looking for a New Year’s celebration that’s tailored for the kids? Westfield Chermside has planned the perfect family outing to ring in the new year. Head to the outdoor dining precinct on Level 2 and you’ll find a family-friendly event that bustling with light and laughter. Check out the live entertainment, balloon drops, bubble machines and fireworks displays at 6pm and 8pm – we guarantee the kids will sleep soundly! If you’re willing to squeeze in a hike before watching the fireworks, it’s worth making the climb to the peak of Mount Coot-tha. Standing at 287m tall, Brisbane’s highest peak provides unbeatable views that are made for enjoying fireworks. Lay down your blanket and take in the panoramic view of the entire city. Don’t feel like heading into the city? Then catch a ride to Portside Wharf at Hamilton where the entire precinct will be celebrating with music and lights. There will be two fireworks shows throughout the night, plus live entertainment going on into the early hours. Make sure you grab a bite to eat as local spots like Byblos, Belvedere Bar and Grill, Sono and Modo often throw elaborate New Year’s feasts. Every year, Cloudland in Fortitude Valley goes all out with a New Year’s Eve bash which rivals some of New York’s finest. This year is no different, with this lavish celebration spread across three levels. The night begins at 7pm with mouthwatering canapes and drinks, and continues with immersive visual displays, live entertainment, pop-up performances, and much more! Celebrate this New Year’s Eve with a bang and book your holiday accommodation at either of our 2 conveniently located Brisbane locations today.